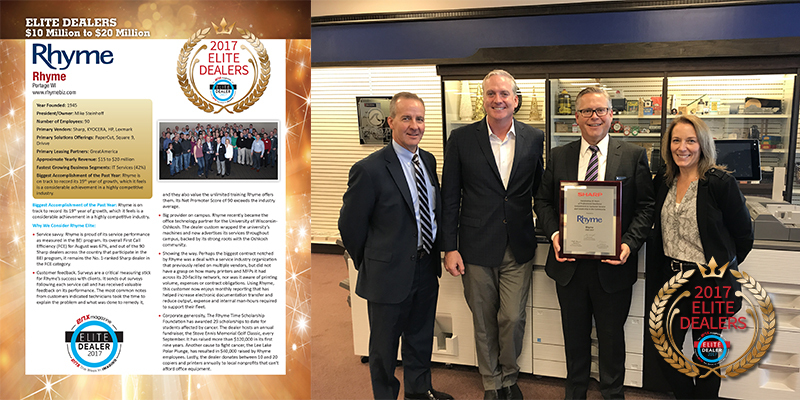 Toluca Lake, CA (October 2017) — ENX Magazine and ENX The Week In Imaging announced that Rhyme has been selected as a 2017 Elite Dealer. This annual Who’s Who of the office technology dealer community, which has been bestowed upon the industry’s leaders since 1988, will be featured in the December issue of ENX Magazine. Rhyme has consistently been recognized as an Elite Dealer, and has also been recognized by Sharp as a Hyakuman Elite Dealer and Platinum Level Service Provider. Rhyme is on track to record its 19th year of growth, which it feels is a considerable achievement in a highly competitive industry.